Photovoltaics, or PV, is a method of converting solar energy into usable solar power through the use of solar panels and solar cells. Historically, glass-encased PV systems reigned supreme compared to their thin-film and flexible PV counterparts. The traditional systems are generally bulky and rigid, thus not allowing for much in terms of design flexibility. The tides have shifted however as the consumer desire to have an aesthetically pleasing way to create solar power increases, allowing the flexible PV systems to claim advantages over traditional PV. As flexible PV efficiencies have become better, falling anywhere between 20 and 30 percent depending on application, demand for these systems has grown. 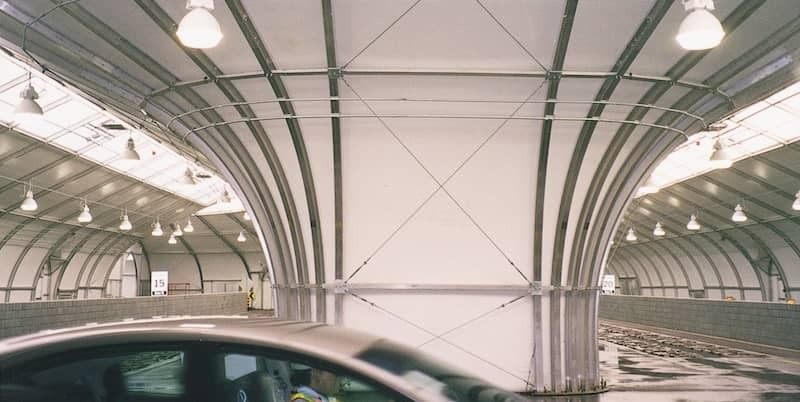 An example of an application comes from Pvilion, a New York based product development company, that has been implementing flexible PV systems in the form of solar fabric carports. Flexible, thin-film PV is able to provide both lower manufacturing and installation costs, increasing its attractiveness and market share. Weight is a benefit of thin-film PV that is incredibly attractive for architectural applications. At times, the product can be one-third the weight of a traditional PV system. The PV’s flexible nature also expands design options as solar array systems can be designed with free-form boundaries. This customizability allows solar array systems to be more easily integrated into overall building designs. While the popularity of thin-film PV is growing, there is still some skepticism on the market. Some of the hesitation comes from the fact that the flexible cells might not be as reliable in certain high-stress applications as those used in glass-encased solar array systems. However, certain organizations are developing ways to house the cells in flexible packages in order to prevent cell breakdown. Overall, the interest surrounding thin-film, flexible PV systems continues to grow and new technological advancements occur as a result. While applications are limited currently, some professionals within the industry project that buildings will be able to have a power generating ‘fabric skin’ that covers the entirety of the building. What are your thoughts on the use of thin-film PV over that of traditional solar array systems? Share with us in the comments! Information in this article is based off content from Advanced Textiles Source.